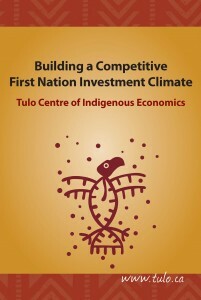 This is the first edition of the open text book Building a Competitive Investment Climate on First Nation Lands. This textbook is for students who are First Nation and tribal government employees or students who would like to work for or with First Nation and tribal governments. The purpose of this textbook is to help interested First Nation and tribal governments build a competitive investment climate. Work began on this text book in early 2012 with a generous grant from the Donner Canadian Foundation. Financial support was also provided by the First Nations Tax Commission and the Tulo Centre. The book is now available in the BC Open Textbook collection.